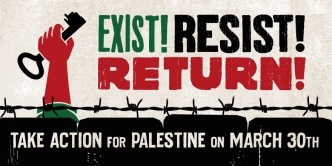 March 30th will be the 1st anniversary of the start of the Gaza Return March. 30 March is also Palestinian Land Day. Palestinians have issued a call for international action on the day. So far, more than 20 towns and cities in the UK have organised solidarity events. Facebook event. We plan to stage a number of events, including a die-in - more information to follow. Charities condemn UK over refusal to endorse Gaza deaths report. UK government refuses to support UN report that shows Israel's killings at Gaza protests may amount to war crimes. UK charities including War on Want and Medical Aid for Palestinians alarmed by UK decision. A look at the UN Findings. The truth is out about Israel's lethal actions in Gaza. Will the world listen? Life in the occupied city of Hebron. Thanks to everyone who came to our meeting last week with Laila Hasan who gave a powerful and passionate talk about life in the occupied city of Hebron. The co-founder of the cooperative Women in Hebron spoke of the regular arrests and humiliations of children as young as 10 with teachers and parents unable to help or even act as witnesses. She described how the army has prevented injured Palestinians being treated in hospitals. 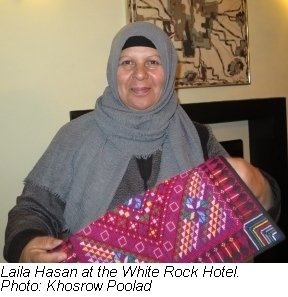 Laila spoke about how the women's cooperative, which produces traditional Palestinian embroidery and crafts, now supports 150 families. For more information or to support the group visit: Women In Hebron. The United Nations postpones the publication of its blacklist for companies operating in Israeli illegal settlements - for the third time. The list includes 206 companies operating in Israeli settlements in the West Bank. The UN has come under pressure after lobbying from Israel, the United States and many of the 200-plus companies that are to be named. One firm on the list is the pharmaceutical company Teva. Teva products are sold widely in the UK - it's on the boycott target list. Article by Jonathan Cook: The UN fails to name and shame firms aiding Israel's illegal settlements. Life Under Occupation: Report From The West Bank. It was great to have such a terrific turnout at our first meeting in Rye. Gill Knight gave a talk about her visit to the West Bank and North Jordan valley at the end of last year. Gill toured with the Israeli Committee Against House Demolitions [ICAHD]. As part of Gill's presentation she described the humiliation Palestinians suffer at Checkpoint 300 in Jerusalem. The talk was followed by a lively Question and Answer session which included a discussion on BDS (boycott, divestment and sanctions). 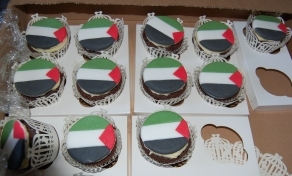 The collection raised £50 for Medical Aid for Palestine, several new members joined - and the tasty Palestinian cakes went down well! Rye members and contacts - an informal get together. Do you live in or close to Rye? Are you interested in getting involved or finding out more about Israel/Palestine and ways to support the international solidarity movement? We're hosting an informal get together on Tuesday 2nd April in Rye from 7pm. This is a chance just to meet, talk, learn a little bit more about Hastings & Rye Palestine Solidarity Campaign and find out how you can get involved. We'll also be holding a 'round table' talk on the subject of 'Boycott, Divestment and Sanctions - what does it mean to me?' followed by an open discussion. This is a great opportunity to get to know some like-minded folk, discuss issues and deepen your understanding and involvement with the campaign. We look forward to meeting you there! Action on Hastings seafront - we were opposing the use of killer drones which are mainly used by Israel, UK and US. According to Al Mezan, Israel has killed almost 2,000 people in Gaza with drone strikes between 2004 and 2014. We shouldn't forget that there are drone manufacturers in our area - in Sussex and Kent. Organised by Hastings Against War. Article in the Hastings Observer: Lets go fly a kite, not armed drones. Thanks to everyone who visited our stall at the Azur. We had loads of great interactions and people were generally very interested. The stall featured information about Palestinian women who have been at the forefront of the resistance to the occupation, including Ahed and Nariman Tamimi - and Khalida Jarrar who had just been released from Israeli prison after 20 months of imprisonment without charge or trial under Israeli administrative detention. The killings in the West Bank continue. 27 year old Yasser Fawzi Shwe had come to deliver documents to an office near Hebron. An Israeli soldier ordered him at gunpoint to come closer; a little later, a shot was heard and Yasser fell on the ground, bleeding heavily. The Israeli military dragged him inside the building and refused to allow any medical assistance. Previously, two cousins, 16 year old Hussam Jabari and 14 year old Bashar Jabari, were killed at the same spot and in the same style. Christian Peacemaker Teams: Shot like a clay pigeon. The global solidarity movement for Palestine has reached a tipping point. Details of cracks in the wall of support for Israel. This runs alongside growing solidarity with the Palestinian struggle around the globe - in New Zealand, India, Nigeria, Argentina, UK, US, Canada....... Examples of BDS (boycott, divestment and sanctions) victories: economic, academic and cultural. "Palestinians have taught the world about resistance to injustice, no matter the might of the oppressor." Israeli conscientious objector sentenced to 30 days in prison. Roman Levin: "My refusal is an act of protest against the occupation that has been going on for more than 50 years, and an act of solidarity with the Palestinian people in the West Bank and the besieged Gaza Strip." Article includes Roman Levin's full statement. Israeli soldiers beat a blind Palestinian man bloody in dawn raid in occupied West Bank. West Bank school attacked by settlers, the second time in one week. Israeli settler violence continues to rise in occupied Palestine. A summary of news from the West Bank and Gaza from Mondoweiss. 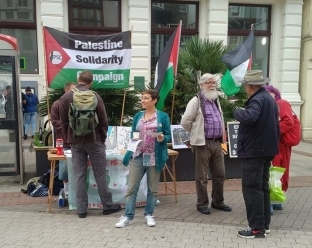 Eastbourne PSC meeting: "The experiences of Palestinian child prisoners." Nihaya Aburayyam, social worker and therapist will talk about her work with child prisoners at the Treatment and Rehabilitation Centre for Victims of Torture in the West Bank. Petition: "We still need to fight for the Tyre School." Netanyahu, in using the village as a political tool in the run up to the impending elections, has stated: "Khan al-Ahmar will be demolished very soon, but I am not saying when. We are prepared for it." Two Palestinian children killed in blaze after Israel blocks fire brigade. Palestine in Pictures: February 2019. Video: The world's most occupied city: Hebron. 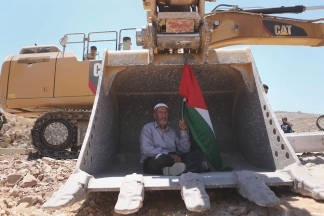 Israeli demolition leaves 10-member Palestinian family homeless. Israel cuts off water supply for 2600 Palestinians in Jordan Valley. Israel lobby funders back breakaway British MPs. 40 Jewish Groups Worldwide Oppose Equating Anti-Semitism with Criticism of Israel. Elections panel bars Arab slate, Jewish far-left candidate; court will now rule. The two-state solution is dead. Let's start planning for the one state. 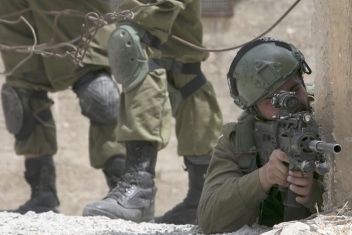 Israeli prof: Israel tests weapons on Palestinian kids, tests drugs on prisoners. Israel has tried to pressure Ireland to block a pro-Palestine bill. The Decisions by Ireland and Chile to Ban Products from the Settlements Israel's concerns at the growing strength of the BDS movement - Statement from Israel's Institute for National Security Studies. Manchester students confront university management over Caterpillar investment as part of Israeli Apartheid Week. Brown University Becomes First Ivy League School To Pass Student BDS Vote. Dutch Green Left Party Votes to Endorse Israel Boycott. We've run weekly information stalls in Hastings Town Centre (either opposite Lloyds Bank or outside Debenhams) every Saturday 12.00 'til 14.00 (2 pm) since 2014. We run fortnightly stalls on the cobbles at the top of Conduit Hill, where it meets the High Street. 11 - 1 pm. For anyone in the Rye area who wants to help out, please email.